You wouldn't know it from this photo, but not so long ago, this was a busy little river. 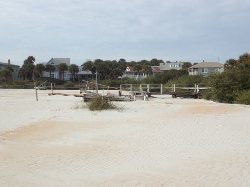 When I first moved to Summer Haven, a lovely little river meandered along behind the protective dunes. It was the home of dozens of species of birds and critters and men had fished it for centuries. When this island was first inhabited in 1885, there were no bridges and folk had to sail down here from St Augustine on the Matanzas River, into which our little Summer Haven River flowed. In the beginning the people who lived and summered here centered their little community on the river where new arrivals first came ashore. A hotel squatted on that welcoming shore and it boasted wonderful views of the busy little river as well as the ocean beyond the dunes. 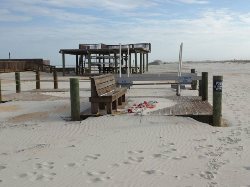 There was a store, a clubhouse with a room big enough for dancing, and more than one boarding house to accommodate all the summer “campers.” For a tiny barrier island, Summer Haven has a very interesting history and connections to some very influential folk over the years, but that’s another story. In 1964, I’m told, a hurricane ravaged this little island and took out a chunk of Route A1A, the road that runs along this chain of barrier islands on the east coast of Florida. What was left of the road on Summer Island became Old A1A and a new road a few hundred yards to the west took its place while a sea wall was built to protect what was left of the shore. But in 2008 another series of storms forged a new breakthrough at the point where the road and the seawall ended and the dunes began. Talk immediately began on how to “fix” this breakthrough before sand infiltrated the river and became a problem. Needless to say every alphabet agency with even the most tenuous connection to such issues jumped into the discussion. And there everything stalled. 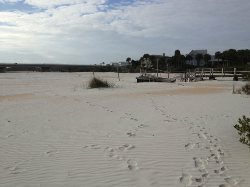 Sand pushed in on every higher than average tide and began to fill the river, swallowing docks and oyster beds, choking off the natural flushing system for the Matanzas inlet, obliterating the habitat of creatures as diverse as manatees, loggerhead turtles, snowy egrets and others who once used the river to forage and nest. Access to boat launching ramps and the Helen Mellon Schmidt Public Park was lost. Docks swamped and surrounded by sand. All the boats have been hauled out and access to the Matanzas river lost. 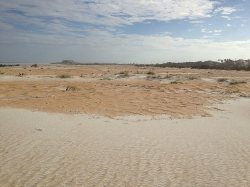 Since then the sea has finally healed the breach it created, but not before the entire protective dune system fringed with lush Australian Fir was destroyed. The river is only a memory now. I don’t know where the fish have gone, but the state just finished repairing a bridge that no longer spans any water. A brave and tenacious neighbor has spearheaded the effort to restore the Summer Haven River, but you would not believe the nonsense she has had to swallow. I’d have punched a few noses by now for sure. The most vociferous are the tern people. You would think, to hear them argue their case that these migratory birds had been nesting here for a millennium. 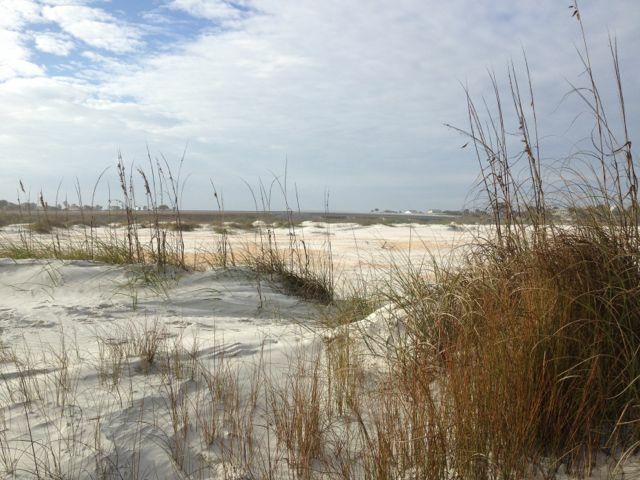 But that is so not the case – they nested less than a ¼ mile away on the north side of the Matanzas Inlet before. And far from becoming inhospitable due to human encroachment, this area has been declared off limits to vehicles by the National Park Service. Then a very expensive study had to be done to determine if it would be appropriate to put the sand currently choking the Summer Haven River back onto the beach! Are you kidding? Where did they think that sand came from in the first place? It is suggested that rebuilding the protective dune would put a barrier between the nesting turns and the sea where they forage for their food. WHAT? When did terns cease to fly? They aren’t emus, for Pete’s sake! As I said, the arguments get pretty ridiculous. And those of us who love this place, we still miss our river. We’d like to look out and see herons and egrets wading around at the edge of a restored and healthy river. We’d like to be able to kayak and fish in its waters and see manatees cruising by again. I’m sure the folk who own the oyster licenses would like to have their livelihoods back and boaters would like access to the Matanzas River and the Atlantic Ocean once again. It’s past time to bring this little river back to health and preserve this historic Summer Haven community. Welcome to the Next Big Thing Blog Hop. A neat way for readers to find new authors and perhaps a whole stash of books you haven't checked out before. My Gratitude to Kellie Sharpe for inviting me and to Vicki Hinze who invited her. About this Blog Hop, I and my fellow authors, in their respective blogs, have answered ten questions about our book or work-in-progress (giving you a sneak peak). We've also included some behind the scenes information about how and why we write what we write -- the characters, the inspirations, plotting and other choices we make. I hope you enjoy it. My first published non-fiction, WHATEVER IT TAKES, came out in June - available at Wings Press.com, Amazon.com and B&N Three Men are in a very close race for the White House. Each will face a tough decision. Decisions that will determine the caliber of the man, the kind of leader he might be and possibly even the outcome of the race. Please feel free to comment and share your thoughts and questions. Here's my Next Big Thing! Meg shrugged her backpack higher up onto her shoulder as she joined the stream of passengers filing past the empty chairs of the waiting area and toward baggage claim. Her scuffed and dusty boots made a hollow sound on the tile floor. A man in a navy blue suit jostled past her, then stopped and thanked her for her service. She took the proffered hand absently and accepted the thanks in spite of the feeling she didn’t deserve it in the least. As she approached the top of the escalator down to baggage claim, she halted abruptly. Her heart began to thump painfully. Ben would be at the bottom of the escalator watching for her. Maybe the boys as well. It had been 358 days since she’d last seen them. 358 days that had changed her forever. The crush of people flowed around her like water flows around a boulder in a riverbed. For a moment she felt like she couldn’t even breathe. All those days ago when she’d been walking the other way with tears in her eyes, she’d been an innocent. An idealistic innocent. She wasn’t the same woman who’d said goodbye to Ben that day. She was no longer innocent. And her idealism had fled in the face of the things she’d seen. And done. Would he see it in her eyes? Feel it in her touch? Surely he would hear it when she called out in her nightmares. Would he still love her if he knew the whole of it? If he knew how far she’d grown away from the woman she’d once been? Meg drew a deep breath and stepped out. He was waiting however much she had changed, and she couldn’t put off the moment of their reunion forever. Ben shifted his weight from one foot to the other in order to peer farther up the descending staircase. He’d left the boys at home so he and Meg could have these first few moments alone. Or at least as alone as it gets in a crowded baggage claim area. The buzzer announcing the arrival of the luggage had sounded several minutes ago and already there were people crowding several lines deep around the carousel. He’d been keeping half an eye on the moving jumble of luggage, boxes, golf clubs and carseats, watching for a camouflage duffle bag. But so far, none had appeared. Neither had Meg. But she would. Soon. She had called after she’d boarded this plane in DC to let him know it was on time and she had made the connection. Her voice had sounded matter-of-fact and unemotional. Very military, he conceded. She was a Marine, after all. And she’d been in a war zone for almost a year. A place where emotions didn’t belong. At least not those reserved for the husband you left behind. He glanced back at the carousel, then again at the escalator. And there she was. Her hair was pulled back into a tight ponytail, but he could see the black sheen of it glistening under the harsh fluorescent lights. Head up, she looked straight ahead. Shoulders back. Very squared away. His Marine. His Meg. Ben’s heart leapt in his chest and shuddered into a staccato rhythm. His Meg was back. Whole and unharmed. And as beautiful as his memory had promised. He couldn’t wait to haul her into his arms and kiss the daylights out of her. He couldn’t wait to feel her arms circle tight around his neck. To feel her lips returning his hunger and longing. It seemed to take forever for the escalator to bring her down to him. At the bottom, she stepped off, turned sharply right and almost ran him down before her gaze finally connected with his. Be sure to check back here often - I'll be sure to let you know when the book is coming out. Kellie Sharpe - author and publisher - Salt Run Publishing, where romance lives on. More than a year ago, my family decided that this year they were all coming to my place in Florida for Christmas. Don't forget I live in a little seaside bungalow, but fortunately for me it shares a lot with another bungalow that happens to be a rental so I was able to reserve it to accommodate the crew. Two little houses right next to each other worked out wonderfully well and we had a terrific week. I'm exhausted, of course, but it was so worth it. Every minute filled with fun and family. My work began before they arrived - not just the usual shopping, wrapping and cleaning, but sewing as well. When we all get together someone always seems to decide that it would look really cute if the kids all had outfits that match and since I sew - guess who gets to make them? The Fun began on the 19th when my son and his crew as well as my youngest daughter and her family arrived at JAX. We spent the next day on the beach since St Augustine had blessed us with a lovely warm day that felt like summer for my visitors. On Friday we all got up long before the sun and headed to Disney where we were met by my step-son and his family and my middle daughter and her family (who had tried the novel idea of putting their van on the train from Maryland which conveniently delivered them to Florida not far from Orlando.) The little girls were all wearing princess dresses and got Bippity Boppity make up sessions. We met all (or most) of the princesses, too, as well as Mickey, Minnie, Daisy Duck, The White Rabbit and so many more characters. We also had tickets to Mickey's Very Merry Christmas Party, which meant we didn't leave there until Midnight. Now you know why I'm exhausted!!! 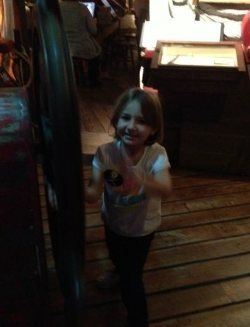 One of my neighbors owns some of the carriages that take folk for rides about the old city in St Augustine and I was able to make arrangements for us all to have a wonderful ride to see some of the historical sites as well as the Nights of Lights Christmas display for which St Augustine was just chosen one of the 20 best cities lit up for Christmas. 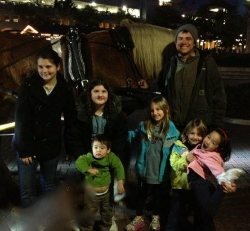 Sean was a terrific driver and they kids were all enchanted with the horse and they fact that he gave them all a turn to "drive." Suzie was a very well behaved animal who treated them well and listened to Sean in spite of the kids. Then came Christmas... 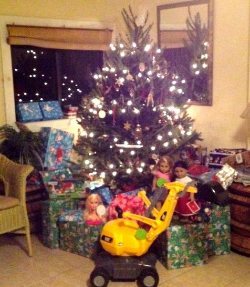 The Elves (on the Shelves) had arrived with the kids and kept an eye on them during the week leading up to the big day. I have to assume a favorable report was taken to Santa because he was very good to us all! 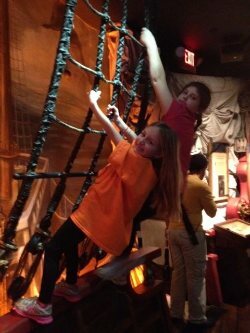 On our last full day together, we visited the Pirate Museum downtown. 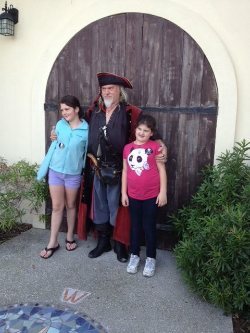 We had a lovely tour with one of my favorite pirates, Capt. William Mayhem. The guys abandoned us to have a pint of Guinness at Anne O'Malley's - just think of the fun they missed! But eventually all good things come to an end. The troops have all gone home to work and school leaving me with a cold they could have kept for themselves and a ton of wonderful memories. It's on to 2013 now - Happy New Year everyone. May God bless you with a year filled with love, laughter and good fortune.